With Marvel’s Runaways a week away from premiering on Hulu, we sat down with actresses Allegra Acosta and Ariela Barer to discuss their characters and experiences on the show. 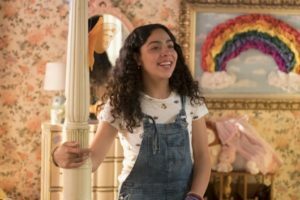 Barer plays the intelligent and quirky Gert Yorkes, while Acosta portrays the role of her adopted sister Molly Hernandez, who soon discovers she has powers beyond her control. In our fourth installment of Runaways set interviews, we talked about the tone of the show and how it’s handling representation. Another exciting aspect of Runaways is the practical puppetry involved with characters that would most likely be CGI elsewhere, such as Gert’s dinosaur Old Lace. When she was brought up, Barer gushed about the work that went into her. “There’s one guy holding her and he knows like all the moves of a dinosaur… I’m just so happy that I get to work with her. You just see her eyes and you see pure innocence, what an animal should have.” She continued to sing the crew’s praises, explaining, “When so much care goes into something like that, it really ups the passion of everyone around it. When you see something that so many people worked on, and really poured themselves into, it really just makes everyone work that much harder.” We personally can’t wait to see how that translates onscreen. 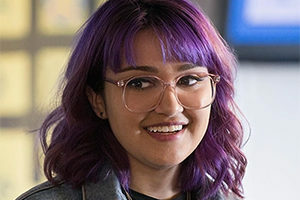 Ariela Barer, meanwhile, touched on the addition of Molly now being Gert’s sister instead of just the youngest member of the group. “A nice thing in the comic is the way everyone kind of looks after Molly. It’s a really nice relationship, so it’s cool to just bring that one step further.” It makes sense to have a pre-established reason to take Molly on the run from the start, instead of having to hash out whether an 11-year-old girl should be in that new environment. Regardless, it’s very clear the actresses have already bonded like sisters and may become the Arya and Sansa Stark of Runaways. Except hopefully their pet doesn’t run away or die. Be sure to check out the first three episodes of Marvel’s Runaways on Hulu this November 21st, and come back daily to find new cast interviews until then.